This is a quote from a fun kid’s book — Stephanie’s ponytail. and that was my response to my blog today — the theme disappeared and it it almost unreadable,. Hoping it gets fixed soon. Thanks to Unshelved I read another great book. 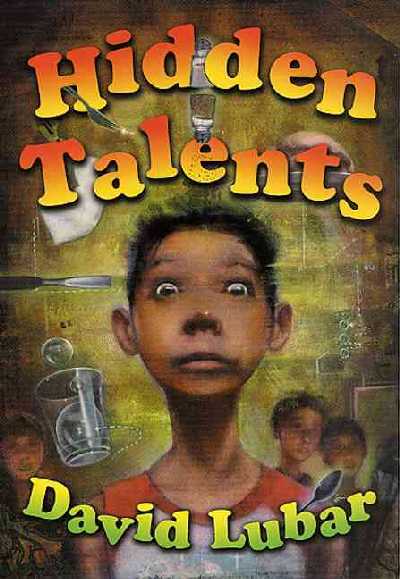 Hidden Talents by David Lubar is an instantly engaging book. First line: All I needed was a pair of Handcuffs. This is our introduction to Martin,who is on his way to Edgeview Alternative School. Edgeview is full of kids who have reached the end of the road. However, some of the kids don’t seem bad, maybe just a little odd. Actually, some of the odd kids seem to have some unexpected talents. Like setting things on fire without matches… And then there seem to be some other problems at Edgeview, of the more mundane sort. The narrative is peppered with scraps of letters, pieces of homework , and reports and evaluations. There are elements of SF, mystery, and the YA problem novel. Although the ending is happy, it isn’t overly neat. There are lots of ways you could approach this novel in a book discussion group. When I flipped the book over, it said that it was recommended for ages 10 and up. Well, not the ten year olds in my book clubs. Not that they wouldn’t like it. and not that I wouldn’t tell them not to read it — there wasn’t any thing ‘too old’ for them. However, most of them lead a more sheltered lives. We read one book ( Hoot) where there was a bully as a major character. Some of them had never encountered a real bully. They understood that bulling was wrong, but they never quite understood the fear. I don’t think they would get the book. So how do I pick books for them. Lots of action is a must. That way you can ask questions like favorite part, or funniest scene, or would a different ending be better. Then I look for a book where motives are clear, if not obvious. And finally, I look for one character that they can imagine as a friend. I think if my book clubs read Hidden Talents, they would find friends. However, I’m not so sure they would get that far in the book. Actually, I ‘d say 12 would be a better age. Mostly because I see a lot more kids that are willing to understand that are different ways to look at the world. I went to a party thrown by a neighbor where we raised over 3000.00 for no on prop. 8 . This was a great positive political experience. So many people that understood that this is a civil rights issue.no on prop 8 . This is not really a complaint, just astonishment. It is not supposed to be so hot in October that gardening in the afternoon is sweaty work. It is supposed to be just warm enough so that if feels good, but not so warm that you have to give up and go inside. Honestly, if feels like the high 80’s out there. In good garden news , I have a mini forest of radish plants that need thinning. Plus my beets have come up. Very exciting. I almost forgot that I wanted to go to the farmer’s market today. Our friend D is the youngest member of a local jazz group , and I wanted to hear him play. I am extra glad when I saw the piles of raw peanuts for sale. I love boiled peanuts and I usually only get them in SC when we visit my folks. But one of the joys of CA is there are so many different cuisines– so you can find almost anything. I have no idea what anyone else does with raw peanuts, but I make southern style boiled peanuts. The process of boiling peanuts also draws antioxidants from the shells. The boiled peanuts have four times the antioxidants of raw or roasted peanuts.